Hey everybody! Happy Wednesday! Lately I've been all about blue fabrics and wrap things! I recently went to Hobby Lobby and got about 9-10 yards total (fabrics were 50%off) of you guessed it....blue fabrics! One with stripes, florals, dots, and a gingham with a pretty border that I'm so excited to cut into! I said all that to say don't get tired of seeing me in blue just yet! LOL! Or wrap things because I love them! Today I'm sharing with you Simplicity 8644 View D wrap top! I believe this pattern is one of the popular ones that was released with this collection because View A is so fabulous! It has those big trendy sleeves, and its cropped making it a great summer top! Although I think it's cute, I was drawn more to View D! I love everything about it. The sleeves, the tie, the peplum all made it the perfect view for me! I cut the size 16 but I feel I should've went up a size for the waist. The bust fits great but the band around the waist FITS!!! That was a fail on my part to not realize that I should've graded up to the 18 for more room in that area. So if you're interested in this pattern, take a minute to make sure the waist will fit you comfortablely. 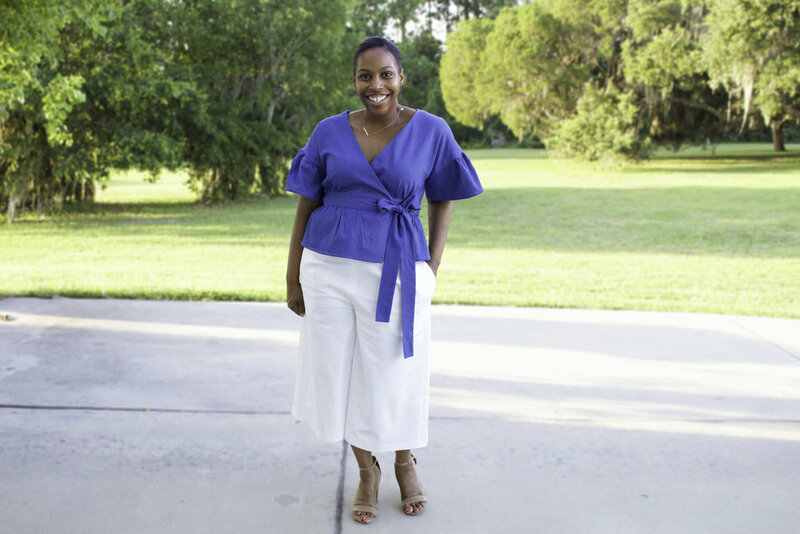 I paired my top with my Butterick 6178 white culottes that I shared in this post. I love these culottes, and I plan to make a couple more! The fit is great and I could wear these all summer long! Fabric Used: Lightweight Denim that I purchased from Joanns. It has a slight stretch in it. What size did you cut? : Size 16. Were the instructions easy to follow? Yes they were easy to follow. What did you like or dislike about the pattern? I love the closure on the inside. Its closed with two buttonholes w/buttons and ties on the outside. No dislikes. Did you make any pattern alterations: None, but as I mentioned above, I should've graded at the was it for the band. Its a tight fit, not too uncomfortable but tight. Would you sew it again? Yes! I would. I can see this paired with culottes as I did here and also a nice pencil skirt. I will make the adjustments when I do re-make it though. Would you recommend it to others? Absolutely!! I think it's a great top with beautiful finishings.